"With the attention of asset allocators now shifting from under–performing public bond and stock markets in the OECD economies to the emerging or growth markets, particularly in Asia, it is timely to have a book written by practitioners in these markets, which examines them in detail. Too often, the emerging markets have been bracketed together under various acronyms BRIC, etc. which hide wide differences and mask the potential and dangers that exist. It is essential to see these markets in detail and with enough solid evidence (and war stories) so future investors can grasp the opportunities that abound. This volume casts a spotlight on a number of emerging and so–called frontier economies that gives investors the beginning of a toolkit for detailed analysis and assessment." "Gordian Gaeta has put together an impressive range of contributions on how to invest in emerging markets. As the book′s thesis indicates, investing in emerging markets can be quite different from that of developed markets. But there are also patterns that one can recognize, and the authors of the book have done a good job in describing what the patterns are. I was especially attracted by the section on China authored by Malcolm Riddell who′s been working on Greater China business issues for many years. Riddell′s views and recommendations are insightful and helpful to the reader." 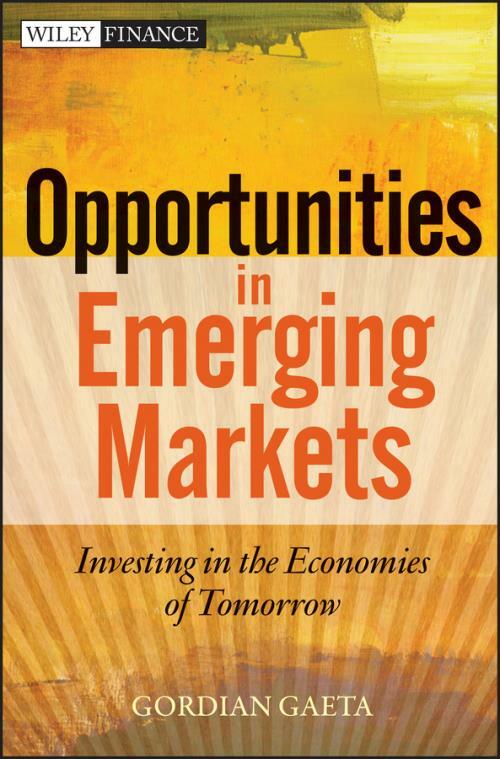 "Opportunities in Emerging Markets is an excellent contribution to the understanding of the economic potential of developing countries and the great long–term investment opportunities they offer." Dr. GORDIAN GAETA is an active private equity investor and advisor specializing in complex and distressed equity and alternative investments and transactions predominantly in the developing economies of Asia. He participates on boards, investment and finance committees, and in executive functions of fund managers, investment firms, and financial services companies. Gaeta started his career as a banker in several countries before becoming a management consultant. A former academic, he also lectured at several universities; served as director, professor, or dean of private academies certifying financial services professionals on investment; and co–chaired the Asian Banker Summit. Gaeta contributes regularly to an investment column as well as investment publications and is the author, coauthor, or editor of various books related to finance, business, and investing, including Frontiers in Credit Risk (Wiley).